Welcome back to What’s Up, your weekly look at all things Gears. The final issue of The Rise of RAAM is out now! Enjoy your last weekend of Double XP Competitive and Core Escalation until Monday! That next Re-Up is within sight. You can do it. Our next Series 3 Drop arrives tomorrow featuring Mechanic Baird, Merchant Navy Dizzy and the Steampunk Weapon Skin set! If you don't already know, Series 3 content is craftable and discoverable in standard Gear Packs. In celebration of the Baird and Dizzy themed Series 3 drop, we're also bringing back Baird's DB Industries Pack and Dizzy's Big Rig Pack! Find both in-game tomorrow until Monday. 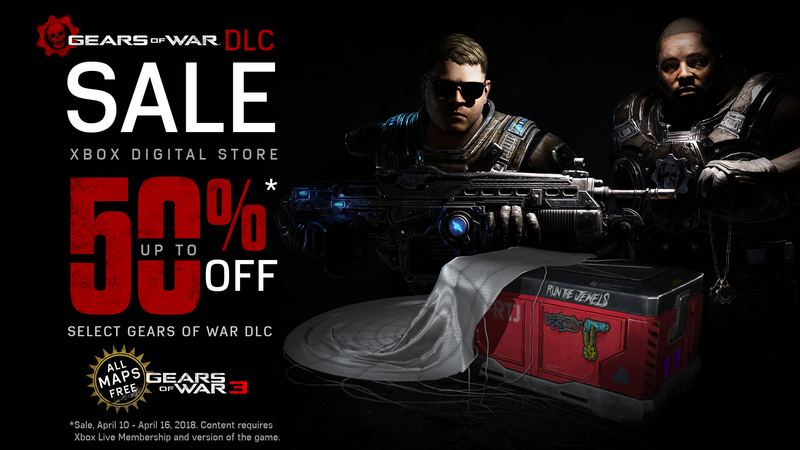 Get up to 50% off Gears of War DLC this weekend in the Xbox Add-On Spring Sale! This Sale includes Gears of War 4's Season Pass and RTJ Pack, the Gears of War 3 Campaign DLC 'RAAM's Shadow' and a whole bunch more. Head to the Xbox Marketplace to check out all the deals. Gears 2 and 3 Maps Are Now All Free! If you're headed for a trip down nostalgia lane in the near future, we've got some great news - every DLC map pack for Gears of War 2 and Gears of War 3 is now available for download free of charge! For Gears 2 fans, the Deleted Campaign Scene 'Road To Ruin' is also up for grabs for free as part of this offer. The Xbox Back Compat team have worked their magic one more - Gears of War 2 is now Enhanced on Xbox One X! That means you can play Gears 2 with 9x the pixel count, increased texture details, and improved anti-aliasing - all made possible without touching the game code. We were blown away when we saw it here in the studio, and we're so excited to have both Gears 2 and 3 now Enhanced on Xbox One X. Check it out in action in the trailer above. If you own an Xbox One X, the Gears 2 Enhanced Update is free of charge for physical and digital owners plus Game Pass holders. What a weekend of Gears Esports. Las Vegas treated us to one of the most memorable events in Gears History, packed to the brim huge plays, big surprises, rises and falls. From the Quarter Finals, the stories began to emerge thick and fast. EU team Fable quickly proved their strong finish in Mexico City was no fluke as they knocked reigning champions Optic Gaming into the Losers Bracket - who would ultimately be eliminated entirely with 2-0 victory from a fired up Ronin squad. In the end, Ghost Gaming took home their first ever championship as a team in Gears of War Esports! EU team Fable improved last event's placement with a second place finish, while LATAM team Ronin secured a huge third place finish for the team. 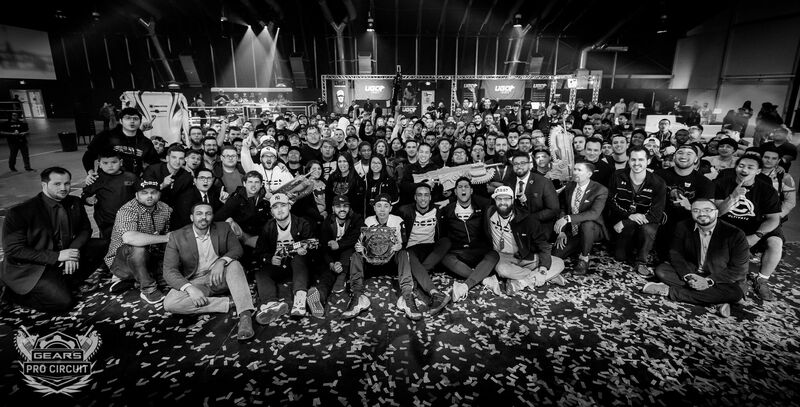 This event showed that hard work, commitment and studying up can ultimately result in solidifying a place as a top team in Gears Esports - wherever you are in the world. Grab some popcorn and watch (or re-watch!) Championship Sunday in the video above. You won't regret it. Thank you to our amazing #GearsFam at the show and at home. Once again, we are humbled by your amazing support. With all the Gears Esports action (and clips!) from this weekend, we skipped over Clip of the Week for the first time on Monday. But have no fear! We have a couple COTW entries to share this week to keep your Clip hunger at bay. 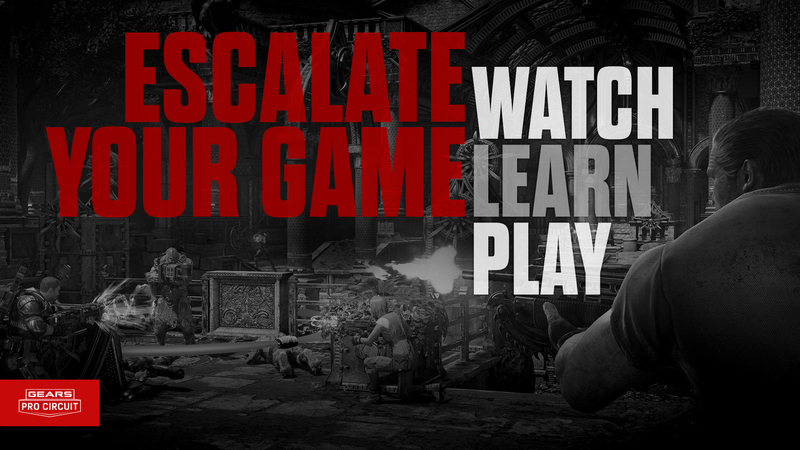 Are you a Gears Video Creator in the community? Tweet a link to your channel to @CoalitionGears with #GearsMOCG for a chance to be featured next week! We’re out there in the community every day reading and responding to our fans. Here's the most notable updates from the team you may have missed this week. All purchasers of the Weapon Collector 3 Pack on March 29 have now been refunded. We are working on getting Weapon Collector 3 Packs out to purchasers. These were available via a marketplace error and were not intended to be purchasable. We are continuing to work through the Challenge Reward Weapon Skins support thread on our forums. Missing Gears Esports Viewership Weapon Skins? Post here. Kill Trading in Core is being discussed at the studio. Looking into missing Season Pass map ownership on Windows 10. Post here if you are experiencing this. Continuing to work with our partners to get two notable Windows 10 issues resolved as soon as possible. Two known workarounds are posted here. Next week, there'll be some big Gears of War 4 news to share. We're excited. We hope you will be too. But that's all we can say for now. See you then.